Our pink crystal Himalayan salt room is truly a unique experience designed to cleanse and rejuvenate the body. Unwind’s holistic atmosphere uses the healing properties of medical grade salt to help treat respiratory and skin ailments. Awaken your senses with our natural therapy by detoxifying your system with a 45-minute session in, what we like to call, our miracle mineral environment. Increased airborne salt levels affect our cell activity, energy and blood sugar levels. A natural disinfectant, salt is antimicrobial and antibacterial. That is why spending a lot of time surrounded by this powerful element can work wonders on our bodies, inside and out. Just think about how you feel after a beautiful day at the beach, breathing in ocean air. You feel relaxed, refreshed and like you can breathe better. Your skin is glowing and your body feels more alive. It’s not in your head. Salt air really can improve your health. While it might seem like salt rooms in spas and salt therapy is a new beauty and wellness trend, this form of therapy has actually been around for centuries. Halotherapy (halo is Greek for salt) originated in caves and salt mines many years ago, all around the world, and many of those natural caves still exist throughout Europe. Today, spas are capitalizing on the benefits of salt therapy and bringing those salt caves to your neck of the woods. All you need is 45 minutes of your time and to sit back, relax, and breathe while relaxing in our zero gravity chairs and swings. 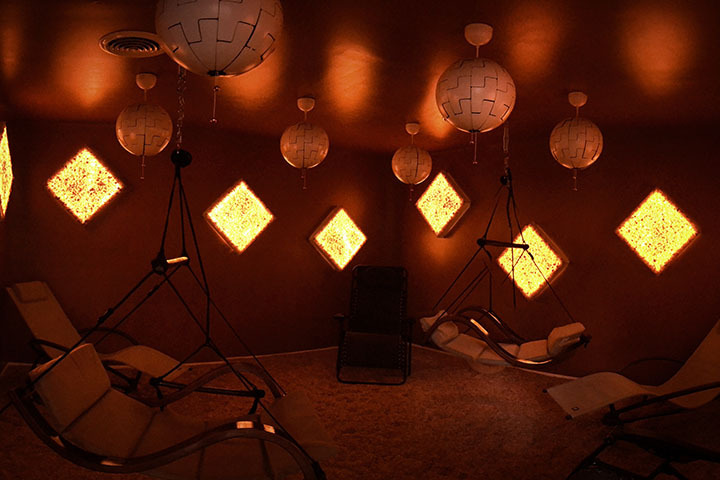 Unlike other forms of therapy, your Halotherapy session at Unwind is short and efficient. 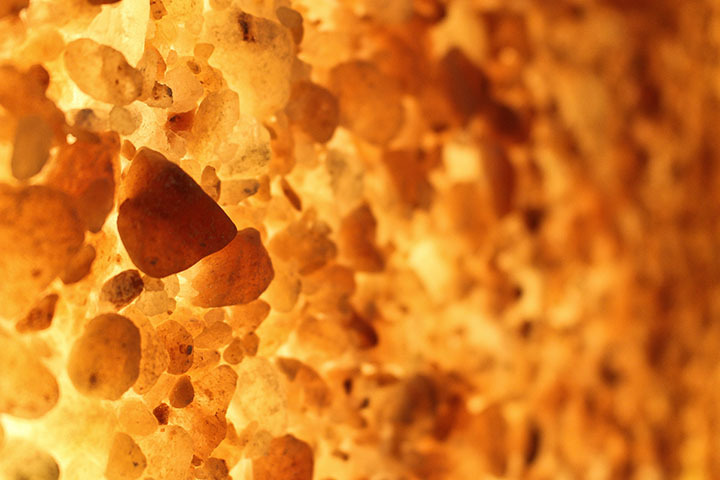 The salt particles that have been evaporated into the Himalayan salt room air are able to penetrate deep into the lungs, bronchi, bronchioles and alveoli. And because this dry salt is so absorbent, once it is in your body it is able to attract pollutants and allergens throughout the respiratory tract, as well as cleanse the respiratory tract, ultimately improving your respiratory functioning. Not bad for comfortably sitting back and relaxing in a tranquil salt-coated environment. While your time in a salt cave may be quick, you will feel the effects of your treatment during or shortly after your therapy, and those benefits will last for long after your spa time is over. Ask us about discounted Halotherapy packages at Unwind. Because the salt is able to penetrate into your respiratory system, it may be able to soothe respiratory issues such as bronchitis, asthma, allergies and sinus infections, in a natural, non-invasive and non-medical way. No drugs necessary, just the natural power of salt air. Any time spent at Unwind can help you feel calmer and at ease, mentally, emotionally and physically. 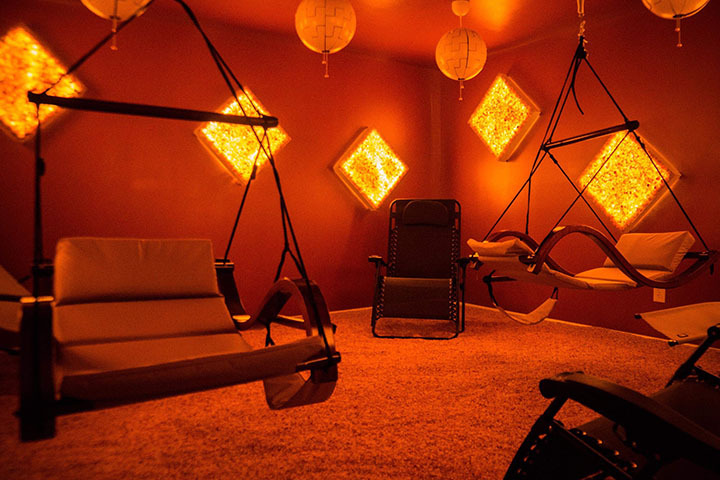 But time in our salt room can help get you to that relaxed state faster and more effectively. You can sit quietly, read, listen to music or visit with your friends. Our Halotherapy room can accommodate up to 6 people at once. Salt is known to reduce inflammation and improve circulation, both of which work to improve your skin, soothe skin irritation, reduce eczema and psoriasis and improve acne. Above all, Halotherapy is a way to safely improve your health from the inside out. It is a completely natural form of healing and relaxation. At Unwind, we invite you to make Halotherapy part of of your overall health and wellness plan along with Flotation Therapy, Infrared Sauna and Therapeutic Massage. Aromatherapy is used to anoint, bless, celebrate and assist in the body’s own natural healing experience.